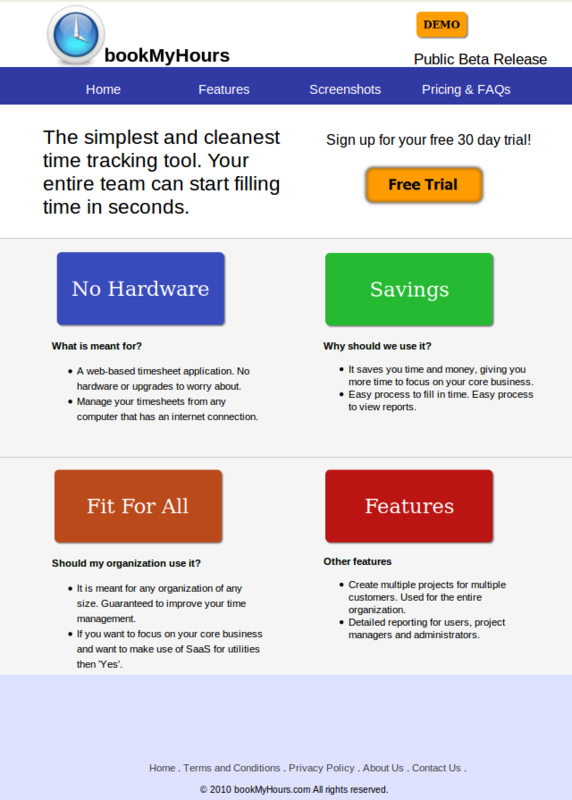 bookMyHours.com is a simple and clean enterprise timesheet application offered as SaaS on a subscription basis. The service is ‘rightweight‘ and consists of the most frequently used features so that the organizations do not have to pay for features that they would never use. It is a multi-tenant application which allows and organization to define their custom look and feel. bookMyHours is based on eHour, the widely popular standalone enterprise timesheet and time tracking application. Inphina is pleased to be the implementation partner for taking eHour to the cloud. eHour is the flagship product of TE-CON and has acquired a huge user base in the last few years due to its simplicity, efficiency and ease of use. A couple of months ago, Inphina was contacted by TE-CON to evaluate the migration of standalone eHour to a SaaS based application which organizations across the world could use on a subscription based model. After evaluating a few platforms and options, Inphina and TE-CON decided to migrate the application on Google App Engine. The white-paper for the migration process is available on the Inphina website. bookMyHours.com is currently in public beta. You are encouraged to try the demo or book a free subscription. Please contact us, if you would like to know more about Inphina’s cloud capabilities.